The HAIR has (nearly) left the building! The hair has about 90 minutes left. I’m hoping I won’t regret this… I’ve had long hair for more than 15 years now. The photo I’m holding is of me circa 1983. I am a tad nervous, so wish me luck. wow, short hair will be quite a change. 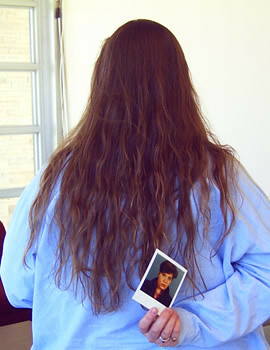 I wore my hair long for most of my life until 1997. Once you go short you may never go back! Wow- what a great way to usher in your 40’s. Happy Birthday, Bird- send me a pic of the new you. The forties are great! Turn yourself loose and do outrageous things. From that old locomotive, 58. Happy Birthday, Greybird…and I hope you liked the cut! YAY! HAPPY BIRTHDAY! Forties are fantastic. In your 20’s you are busy screwing up your life – being young & stupid. In your 30’s, you are busy cleaning up the messes from your 20’s. In your 40’s, you can sit back, put your feet up, and cruise along. I’ll get back to you in a couple years when I figure out the 50’s. But I think you end up seeing a lot of doctors, and I’m not talking about one’s social life. I hope your new short haircut makes you feel as young as you want to! Really though, cutting your hair will definitely make you look younger.